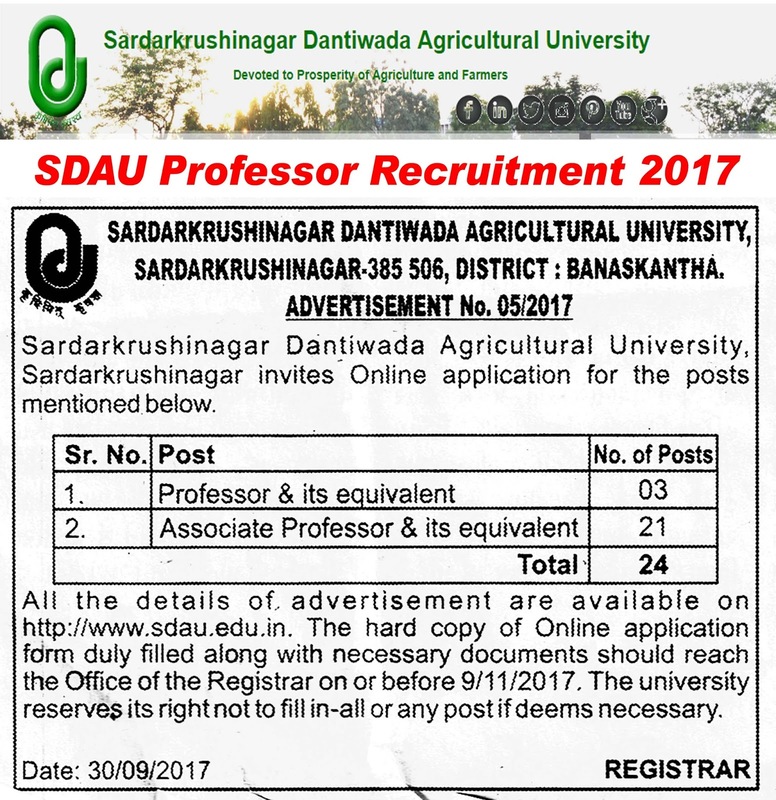 Sardarkrushinagar Dantiwada Agricultural University (SDAU) – www.sdau.edu.in – published latest jobs official notification for the post of Professor & Associate Professor (24 posts) at SDAU Jobs website www.sdau.edu.in. So Interested & Eligible candidates can apply online this vacancy read full official notification and other details are mention below link. The Registrar, Sardarkrushinagar Dantiwada Agricultural University, Sardarkrushinagar-385 506, District : Banaskantha (Gujarat State) invites applications in the prescribed Performa for the below mentioned posts. Professor & its Equivalent: An eminent scholar with Ph.D. qualification(s) in the concerned/relevant discipline and published work of high quality, actively engaged in research with evidence of published work with a minimum of 10 publications as books and/or research/policy papers. Associate Professor & its Equivalent: A Ph.D. Degree with First Class at Bachelor’s or a Ph.D. Degree with Master’s Degree in the Agricultural Engineering & Technology, and experience of eight years in teaching, research and / or industry at the level of Lecturer / Assistant Professor or equivalent grade, excluding period spent on obtaining the research degree. Age relaxable in case of WOMEN candidate will be applicable as per State Agricultural Universities of Gujarat (SAUG) statutes and guidelines of Government of Gujarat from time to time. The General and SEBC candidates will have to pay Rs. 1000 (Rs. 500 application fee + Rs. 500 processing fee). There will be no application fee for SC / ST / PH candidate of Gujarat, however they will have to pay Rs.. 500/- as processing fee. Selection Process : SDAU Jobs Candidates Final selection will be based on Merit list. How to Apply ? Interested and eligible candidates can apply online in Prescribed Application format & The hard copy of the application along with self attested copies of documents & certificates, pertaining to the qualifications and experience accompanied with the copy of the bank payment receipt (As per “State Bank Collect” payment made via onlinesbi.com only) should reach to given below address. Note : The application must reach the Registrar on or before the last date prescribed for receipt of applications. The applications received after the last date shall stand rejected automatically. No intimation in this regard will be communicated to candidates. Address: The Registrar, Sardarkrushinagar Dantiwada AgriculturalUniversity, Sardarkrushinagar.